SOLID, a specialist in the storage, analysis and processing of social data related to truck drivers in France and Europe, launched a new version of its software – SOLID 6 – at the SITL exhibition in Paris. The solution is now available via Trimble’s cloud service, which facilitates its deployment and access for different users at a given transport company. With direct access through any web browser, users can store, manage and share data in only a few simple clicks. 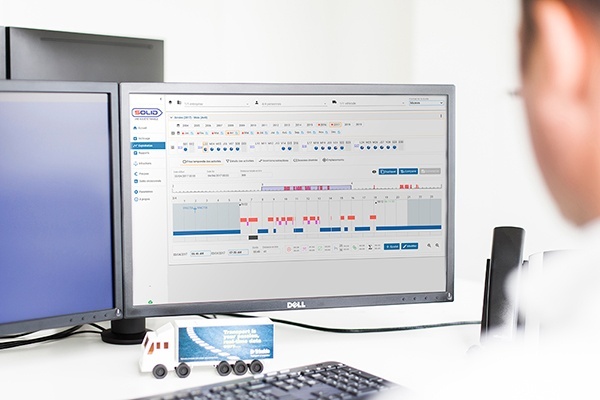 SOLID's software enables companies operating 3.5t trucks to carry out regulatory monitoring of driver activities, which are consistent with European Regulations and National legislation on social data in the Transport industry. Social data generated by tachographs can be stored and subsequently used to prepare drivers’ wages. Christophe L'Hermine, who recently joined the Trimble group to lead the Social Data Solutions Division, said: "Today, our customers need a simple, powerful and reliable tool enabling them to analyse and optimise the activity of their driver teams in compliance with the regulations. Our new platform builds both on SOLID's expertise and on a new, user-friendly, high-performance web technology that frees customers from the complexities and cost associated with IT." The deployment of SOLID 6 as a Software-as-a-Service (SaaS) solution provides customers with a number of advantages, including easy software implementation, updates and accessibility as well as outsourced IT hardware resources to reduce capital and organizational costs. SOLID has always been committed to offering simple and intuitive software solutions that empower users to work more efficiently. SOLID 6 is part of this process. The latest version provides a visual dashboard, which enables users to analyse data over periods of a year or more, for one or even several different drivers. Infringements are calculated quickly and can be sent to the drivers by email, and reports can be customised in a variety of ways to improve user experience. SOLID 6 will be showcased at the International Transport and Logistics Week SITL 2018 at stand F61 in Hall 6 from 20th to 23rd March in Paris. Carriers are invited to come and test the new software tool with their Tacho files (internal memory or digital driver cards).